HICKORY, N.C. - Snapping their three-game losing streak, Kannapolis used a game-winning double from Ian Dawkins in the ninth inning to edge the Crawdads, 6-4, at L.P. Franz Stadium Friday night. Tied 4-4 in the ninth inning, Alex Destino reached after a seven-pitch at-bat with closer Grant Anderson (L, 0-1), moving up 90 feet just a few pitches later after a single to left field off the bat of Ramon Beltre. With two runners on, Dawkins roped a 1-2 pitch to left-center field off Crawdads' closer Grant Anderson (L, 0-1), scoring Destino from second to give the Intimidators their game-winning run. 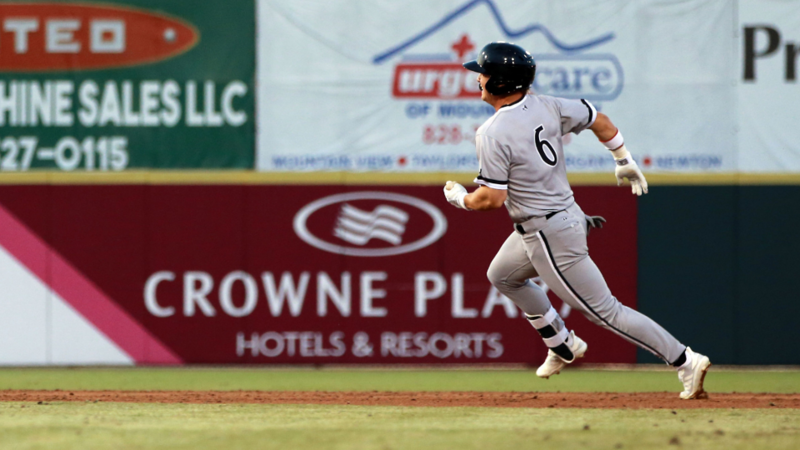 After failing to bring in Steele Walker and Lenyn Sosa in the first inning after they reached on singles, the Intimidators capitalized in the second frame against Jean Casanova, as Michael Hickman led off with a hard single through the right side. Two batters later, Destino continued his hot hitting at the plate with a single up the middle, followed by a Beltre single that one hopped the wall in center field, scoring Hickman from second. Next up, Dawkins muscled a ball over the shortstop's head, bringing in Destino from second base. Not done yet, Walker cranked a ball to the warning track in straight away center field, scoring Beltre for the Intimidators' third run of the inning. With two outs and a runner now at third base, Lenyn Sosa knocked in Dawkins with a line drive single into right field, capping off a four-run second inning for the Intimidators. One inning later, the Crawdads tacked on two runs with a two-run shot over the left field wall off the bat of Curtis Terry, cutting the lead in half, 4-2. After putting up three zeroes on the board, Davis Martin surrendered back-to-back home runs from Pedro Gonzalez and Jonathan Ornelas, proving to be the second straight night that the 'Dads have accomplished that feat. Martin tossed 6.1 innings for the Intimidators, giving up four runs on six hits. Sam Long (W, 1-0) and Wilber Perez (S, 2) combined to strike out a combined four batters over the next 2.2 innings, keeping the game at a deadlock, 4-4, for Dawkins' game-winning double in the ninth. Ryan Newman will send LHP Konnor Pilkington to the mound against Crawdads' LHP John King. First pitch is set for 6:30 p.m.